Connoisseurship of the vessels produced by the Grueby Faience Company and the Grueby Pottery has been surprisingly slow to develop over the p ast forty years, during which time collections, exhibitions, and scholarly publications have featured them as exemplars of the American art pottery movement. As early as 1900 Keramic Studio noted that “no collection would be perfect without a piece of this ware” (while acknowledging that “seeing so many pieces together gives a sense rather of monotony”). A few specialists like Martin Eidelberg and Susan Montgomery pioneered historical information on the pottery, but curators have often admired Grueby vases from afar, reluctant to acquire significant works for museums. The recent gift to the Dallas Museum of Art of a Grueby masterwork (above) has occasioned a reassessment of the finest objects produced by the firm, providing a framework for evaluating its forms and glazes and those sublime moments when they come together perfectly. Donated by longtime collectors and Dallas Museum supporters Dorothy and Edgar McKee, the vase displays the confidence, grace, and sophistication that mark the best examples of early American modernism. Designed by Grueby’s artistic director, George Prentiss Kendrick, this handled vase form was illustrated repeatedly in period articles and the firm’s advertisements and was shown at trade exhibitions around the world. There are many extant versions and examples. Why does this one stand out? A 1904 company brochure, likely developed in association with the pottery’s display at the Louisiana Purchase Exposition in Saint Louis, described Grueby’s “peculiar texture” as similar to “the smooth surface of a melon or the bloom of a leaf, avoiding the extreme brilliancy of high glazes as well as the dull monotony of the mat finish.” The pottery is best known for its cucumber green gla zes, and other colors are quite rare on significant pieces. The ocher color of the Dallas vase is as subtle and distinctive as any American glaze achieved during this period. Its texture is essential to the overall effect—at times pooling to reveal its own viscosity and hue, while at others stretching thin in the firing to reveal the details of the leaves. Among ocher-colored vases, the vase with handles has no rivals for the quality of the texture, color, and firing of the glaze, but significant related models do exist, such as the vase by Wilhelmina Post above While this five-sided vase was a popular production item, here the unusual white buds immediately command attention, along with the frothy and variegated texture and glorious palette. The interaction between the ocher underglaze and an overcoat of a subtle, almost algae-like, green-tinted clear glaze that settles and pools in intentionally uneven ways yields a depth of color and a naturalism not seen on any other known example. Look now at the Jonquils vase (left), which features the deep, heavily textured “elephant skin glaze” found on some of Grueby’s best vases. It is the coloring of the flowers that sets this example apart. The Jonquils vase was a popular production model, and the pottery was often a bit too inventive with it, for example coloring the flowers differently on different sides. Often, too, the pottery let the craft component slip, resulting in running, messy glazes that failed to sit just on the blossoms. Sometimes the entire piece was simply dunked in a single color glaze. Here not only are the flowers colored separately, but the glaze is perfectly applied on each one. Still, it must be noted that even a perfectly executed Jonquils vase is unable to rival the dramatic presence of the vase with handles. Another vase of exceptional color is the Lily of the Valley, the pottery’s only extant work decorated with that floral motif (right and detail below). So deeply saturated is the glaze that it appears almost as if raw pigment were rubbed into the surface. The union of the color and the frothy variegated texture of the glaze on this piece by Ruth Erick son, another of Grueby’s most talented artisans, is seamless. Moreover, the highly stylized floral ornament is dramatically integrated with the overall shape, which swells slightly at the foot and tapers toward the top, elegantly presenting the lily buds just where the vase again bulges slightly, finishing with a subtle collar at the top. 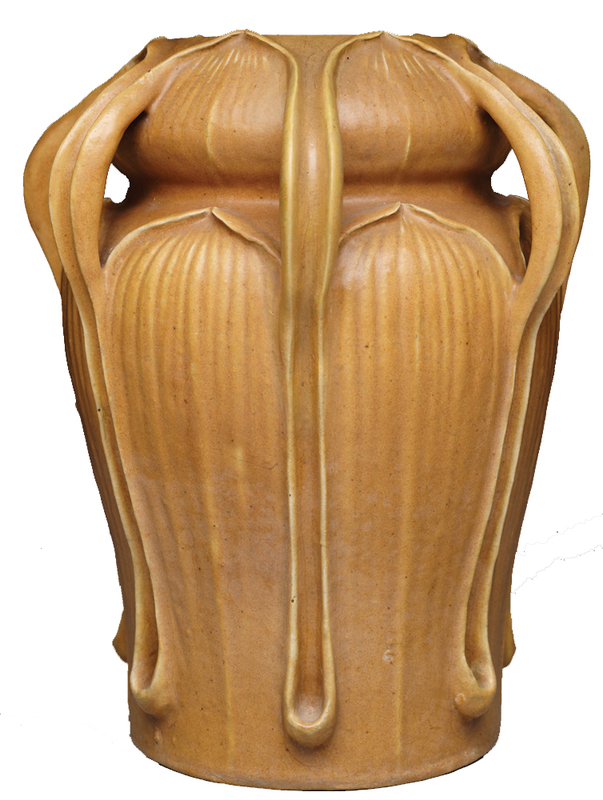 The Dallas vase with handles is a singular embodiment of what one Grueby Pottery brochure described as the firm’s aesthetic inspiration: “motives…taken from certain common forms in plant life, such as the mullein leaf, the slender marsh grasses, the lotus or tulip, treated in a formal or conventional way.” Here the structural details carry out the theme as much as the decoration. Starting at the foot, note the restrained but satisfying flair upward, which grounds the vase while thrusting it vertically with a power seen on few examples. The organic arms also swoop upward in a natural way, consistent with how flower stems grow. The leaves, both on the midsection and upper lobe, are perfectly sculpted and ideally articulated through the glaze; the short collar between the lower vase section and t he top lobe reinforces the ornamental primacy of the leaf systems. This vase succeeds where most do not in retaining its unity from the foot to the top. Its tightly corseted mouth denies any possible suggestion of using it as a lamp base—for which most examples of this form were designed. The unity and elegance of the Dallas vase provoke comparison with two other great Grueby works, the Double Gourd vase (right) and the Daisy vase (below and detail). The Double Gourd vase, also designed by Kendrick, likely in 1897 or 1898, exhibits subtle shaping and an overall harmony that suggest a relationship to Chinese design, which, together with the fairly brutish “grueby / boston, mass” mark indicates that it was among the pottery’s earliest efforts, possibly even formed by William Grueby himself. Exemplifying the pottery’s best works are the vase’s fastidiously shaped crisp edges, carefully smoothed leaves, and the exact hue, thickness, and viscosity of the glaze. The last test of any work of Grueby is the extent to which it can hold its own with Erickson’s Daisy vase, the size, decorative scheme, and complexity of design and decoration of which place it at the apex of Grueby’s creations. Made specifically for exhibition, the Daisy vase survives in four extant examples, likely fired in pairs to ensure consistency of glaze color and texture. The best two, the one shown here, the other in the Charles Hosmer Morse Museum of American Art in Winter Park, Florida, are covered with a mint green glaze that stretches across the surface, creating a waxlike mesh of color and texture that brilliantly approximates the look of algae on the surface of a pond. The tall leaves and stems (created with carving and applied slip) that rise out of this primordial scum shoot upward toward the crest of the vase, where the flowers form a stylized band of decoration that rivals any such ornament from the period. This comparison is a bit of a cheat: of course, the Daisy vase has size and decoration on the Dallas vase with handles. But compare the two—come to your own conclusion. Which is better designed? Better executed? Has a more sublime glaze? Which is more dramatic? More beautiful? Happily, the McKees’ important and generous gift of the vase with handles ensures that we will be able to ponder such questions for years to come. Joseph Cunningham is the curatorial director of the American Decorative Art 1900 Foundation. Vase with handles designed by George Prentiss Kendrick (1850-1919), Grueby Faience Company, Boston, c. 1898. Impressed “grueby faience co./boston, u.s.a.” in circle around a lotus blossom on the bottom. Glazed earthenware; height 11 1⁄16, diameter 9 3⁄8 inches. Dallas Museum of Art, gift of Dr. and Mrs. Edgar G. McKee. Ocher vase, designer unknown, modeled and glazed by Wilhelmina Post (b. 1867; active 1898-1907), Grueby Pottery, 1900-1908. Incised “WP [in monogram]” and impressed “grueby pottery/boston, usa” in circle around a lotus blossom on the bottom. Glazed earthenware; height 11 ½, diameter 5 ½ inches. Private collection; photograph by Gavin Ashworth by courtesy of the Carnegie Museum of Art, Pittsburgh. Jonquils vase, designer unknown, modeled and glazed by Ellen R. Farrington (1877-1919), Grueby Pottery, c. 1904-1908. Incised “ERF” and impressed “grueby pottery/boston, usa” in circle around a lotus blossom on the bottom. Glazed earthenware; height 11 7⁄8, diameter 5 ¾ inches. Private collection; Ashworth photograph. Lily of the Valley vase, designer unknown, modeled and glazed by Ruth Erickson (b. 1883; active 1899-1910), Grueby Pottery, 1905. Incised “RE [in monogram]” and with the date “12-10-05,” and impressed “grueby pottery/boston, u.s.a.” in circle around a lotus blossom on the bottom. Glazed earthenware; height 10 ¼, diameter 4 ¾ inches. Private collection; Ashworth photograph. Double Gourd vase attributed to Kendrick or William H. Grueby (1867-1925), Grueby Faience Company, c. 1897. Impressed “grueby/boston, mass” on the bottom. Glazed earthenware; height 14 ¾, diameter 8 inches. Private collection; Ashworth photograph. Daisy vase modeled and glazed by Erickson, Grueby Pottery, c. 1904-1908. Incised “RE [in monogram]” and impressed “grueby pottery/ boston, u.s.a.” in circle around a lotus blossom on the bottom. Glazed earthenware; height 16 ½, diameter 8 7⁄8 inches. Private collection; Ashworth photograph.